I'm experimenting my lyricist talent with Songify apps on my Motorola Droid Bionic. It's a good apps to know, how your lyrics will turn into a complete song and how they will sound later. But, I'm very much disappointed about it's pop-up ads. Every 30-40 sec a pop-up appears, very bad to concentrate on my business. So, I need to stop this annoying pop-up ads from Songify. How do I get the coin packs for free? I'm also looking for any cheats/hacks to stop those annoying ads of songify from my sweet little Xperia mini. You need to mod songify.preferences.xml file of your phone to get rid of those pop-up ads. 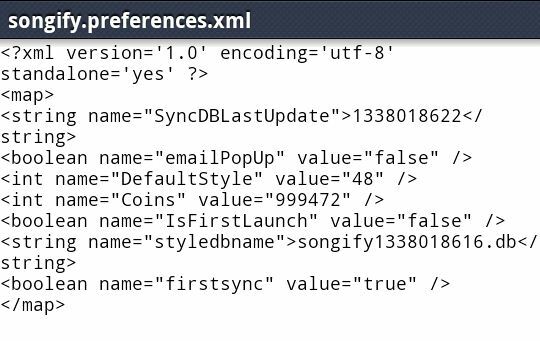 Just use any root explorer and open songify.preferences.xml and change as per attached image and save it as the original. Not in other name, replace original file with the modded file. Now enjoy songify without any pop-ups and look, you have found some free coins also. One modd two problem solved. Ciao. Many thanks for the solution. But, how do I get root explorer to modd songify? Is it with the game or another apps? It's free or paid? If paid, I'm out of this. It won't cause other problem of xperia mini .. nah. Please tell me more clearly. Root explorer won't harm your phone, only change the specific apps root files as per code entered and saved. Google for free root explorer for android mobile phone and download any on your phone, then open songify.preferences.xml file with root explorer and change as per image and save. Just simple modd.